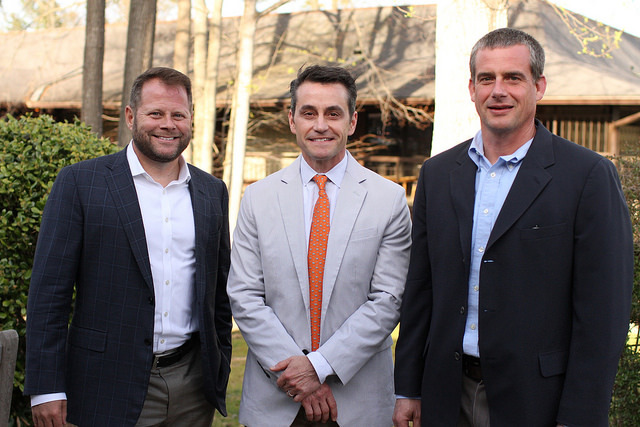 Durham Academy alumni Charlie Wilson and David Ravin — both members of the Class of 1989 — and Associate Head of School Lee Hark have been honored with DA's Distinguished Alumni Award and Faculty and Staff Legacy Award, respectively. The awards were presented by the DA Alumni Association at the April 13 Spring Alumni Reception. In opening the ceremony, Alumni Board President Garrett Putman ’94 described the three honorees as “successful builders.” In the case of Wilson and Ravin, that description can be taken literally; Wilson is president of C.T. Wilson Construction Company, and Ravin is president and CEO of real estate development company Northwood Ravin. Wilson holds a Bachelor of Science in civil engineering from N.C. State University and a Master of Science in civil engineering from the University of Texas, Austin. He leads C.T. Wilson Construction Company, which at 66 years old is the largest family-owned construction company in North Carolina. In recent years, the company has built and renovated a variety of structures in central and eastern North Carolina; projects in Durham include Golden Belt, Venable Center, Durham Co-op Market and the N.C. Museum of Life and Science’s Magic Wings Butterfly House. In addition, C.T. Wilson is responsible for Durham Academy Upper School's Learning Commons and Kirby Gym, and the company is overseeing the construction of the Upper School STEM and Humanities Center. Ravin holds a Bachelor of Architecture from UNC-Charlotte, a Master of Architecture from the University of Michigan and a Master of Science in real estate from the Massachusetts Institute of Technology. Recently named one of Charlotte’s “Most Admired CEOs” by the Charlotte Business Journal, Ravin serves as the head of Northwood Ravin, a real estate development firm that has grown from 43 employees in 2011 to more than 250 employees today. The company is the fourth-largest commercial developer in Charlotte and the second largest in the Raleigh-Durham area. Among Northwood Ravin’s 19 projects in the Triangle is Carolina Square, a mixed-use development on Chapel Hill’s Franklin Street that is anchored by the first urban Target in the state, and Van Alen, a $158-million mixed-use development adjacent to the Durham Bulls Athletic Park. Prior to the evening reception — in which Wilson and Ravin presented one another with the Distinguished Alumni Award — the two spoke at an Upper School assembly. With such good fortune comes a responsibility to help others and to respect people who weren’t born so lucky, Wilson said. For example, he has made it a priority to narrow the pay gap between the highest-paid and lowest-paid employees, and C.T. Wilson recently became one of just a few constructions companies to be certified as paying all employees a living wage. Wilson and Ravin have remained close with one another and with many of their classmates in the nearly three decades since they graduated from DA, and they encouraged students to make the most of their high school years by getting to know as many of their classmates as possible. Hark — who holds a Bachelor of Arts from UNC-Chapel Hill and a Master of Arts in Education from the University of Georgia — has served in a variety of roles at DA over the past decade, including as Upper School director, coordinator of faculty recruitment and Upper School English teacher. Since 2013, he has served as associate head of school; in that role, he spearheaded “The DA Graduate: A Mission-Driven Life” project and the faculty’s curriculum-mapping work. In July, Hark will become head of school at Greenhill School in Dallas, Texas. Before presenting him with the Legacy Award, Upper School theater teacher James Bohanek reflected on Hark’s legacy at DA. “Lee conducts himself how we want all of our students to conduct themselves — with a zeal for life, a willingness to take risks and the courage to stand up and say, ‘I care about this,’” Bohanek said. In accepting the honor, Hark expressed his gratitude to the two heads of school who have led DA during his tenure: Ed Costello, who served as headmaster until 2013, and current Head of School Michael Ulku-Steiner. View more photos from the Spring Alumni Reception on Flickr. View lists of previous recipients of both the Distinguished Alumni Award and Faculty and Staff Legacy award at www.da.org/alumniawards.